The worldwide leading provider of warehouse and logistic systems SSI Schaefer and the medical technology company CareFusion have deepened their collaboration in the pharmaceutical industry. CareFusion offers customised solutions with the Rowa automation systems for automated medication handling in hospitals, pharmacies, online pharmacies and wholesalers. More than 5,500 systems worldwide have been produced by CareFusion at their Kelberg/Eifel location, installed on-site and maintained during live operation. Rowa automats are fully automated to register, store and pick medications in compact spaces. In the area of pharmaceutical picking, Rowa systems are often used for medium to slow movers, and in anaesthetics or cold storage areas. Thanks to the intelligent software application, they can be integrated into existing software and hardware solutions. SSI Schaefer has comprehensive know-how and technology for the pharmaceutical supply chain. This includes manual as well as semi-automatic and highly automated solutions such as A-Frame automats for picking fast movers, the Schaefer Miniload System and Schaefer Carousel System for storing and picking medium movers or for consolidating orders, in addition to the Batch Pick ’N Scan sorter for registering and sorting a wide range of products. Individual work stations for processing and picking, conveying systems, handling systems, racks, storage and transport loading units and customised software solutions round out the product pallet. SSI Schaefer is the single source for everything from planning, implementation, and start-up to operational assistance services. Both companies want to continue their collaboration in the future to be able to offer customer-specific logistic solutions with a standardised design for the pharmaceutical and health industries. The agreement unifies different competencies in the areas of consultation, project management, installation and customer service. Pharmaceutical wholesalers, distributors and online pharmacies should especially profit from this cooperation in the future. “Thanks to years of experience, SSI Schaefer has become a market leader in the field of pharmaceutical warehousing and distribution. The Rowa automats complement our product portfolio for picking medium and slow moving products, as well as in the areas of cold storage, anaesthetics and returns applications. They offer fully-automated integrated serial numbers, expiration dates and lot registration with extremely high storage density,” explains Manfred Preiss, vice president for global sales at SSI Schaefer. The family-owned group of companies is represented in 55 countries and brings with it an extensive list of references, contacts and collaborations. 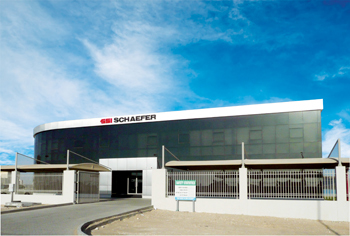 Since its inception in 1937, SSI Schaefer has been an owner-operated, German family company and has over 50 subsidiaries worldwide, Whether in industry, trade, commerce or public organisations, its products are in use on all continents. The company is one of the world›s largest total solutions providers and components manufacturers in the following sectors: logistics stystems, storage and conveying, workstation, logistics software and waste management technology.